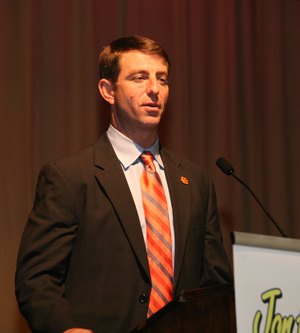 Clemson head coach Dabo Swinney told reporters Saturday evening that 12 players missed the team’s pre-game meal. Though for good reason. Said Swinney: “I said, ‘You gotta be kidding me. There’s no way (we have 12 guys miss the pre-game meal).’ All were trapped in an elevator, in between the first and second floors. It was (Antoine) McClain, (Chris) Hairston, (Tyler) Fowler, (Matt) Sanders, David Smith, Dwayne Allen, Chad Diehl, (Drew) Traylor … every big person on our team. 5,000 pounds. And they were trapped in there for almost 50 minutes.